I have realized, not without some chagrin (but it feels good to ‘fess up and admit it), that I am lousy at enrobing. I do mean chocolate dipping, of course. I’m okay at getting myself dressed. And since enrobing is a pretty important skill for a student chocolatier to learn, it’s making me more than a little depressed. All of my attempts at dipping/enrobing so far, have resulted in irregularly shaped blobs of chocolate with large skirts of extra chocolate around the base. I find myself looking longingly at videos of enrobing machines that send a lovely thin waterfall of perfectly tempered chocolate over the centres, merrily trundling their way along a conveyor belt and emerging out the other side perfectly enrobed, with no unsightly skirts or ribbons of extra chocolate, no bubbles or bumps. I feel a mad impulse to order one, thinking it a perfectly justifiable expense (do I really need a retirement fund? ), and imagining finding space for it in our already overcrowded laundry room. Mmm, doesn’t that sound appetising? Chocolates studded with a soupcon of dryer lint? And then, I watch an inspiring video of William Curley (a fantastic London Chocolatier and Scotsman, who I raved about last week) tempering and enrobing truffles by hand, and making it look oh so easy. 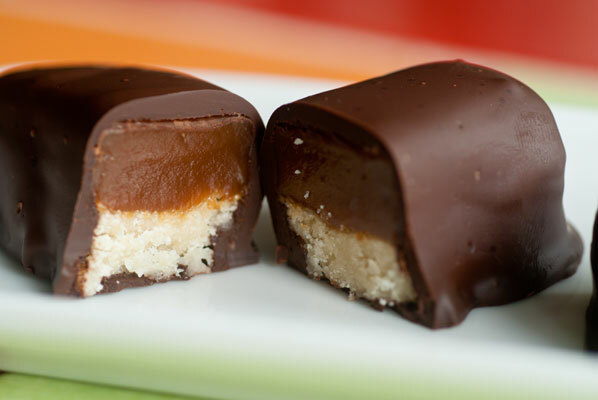 Therefore, I am devoting this week to trying to improve my technique, and since I seem to be having difficulty with small, delicate centres, I am going to indulge my own personal taste, and practice on something sturdy I like – Homemade Twix Bars. 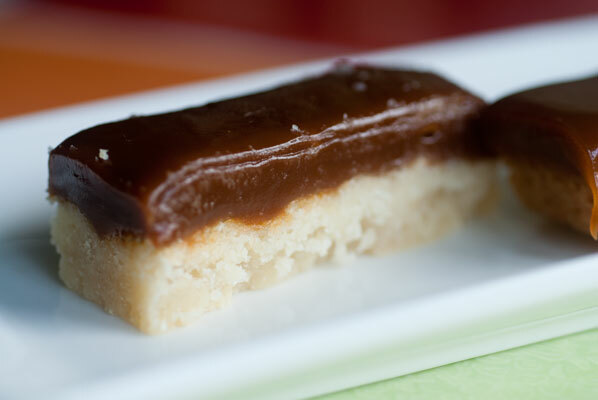 The recipe is actually very similar to another of my Scottish favourites – Millionaire Shortbread. This recipe is from Ashley Rodriguez’ website – Not Without Salt, which she adapted from Sherry Yard’s Desserts by the Yard. 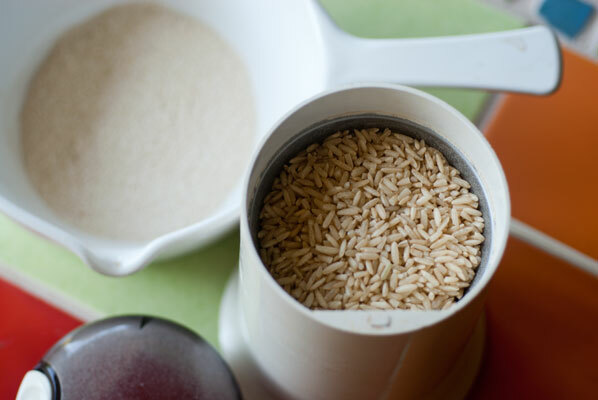 I don’t know whether it’s Ashley’s adaptation or not, but I love the fact that this recipe calls for a tiny amount of ground rice in the base. It provides a little extra crunch and texture, and for some reason, made me feel I was adding a nutritional boost! All goes well when I cut into the layers, and I am able, with a pizza wheel and a sharp knife, to score out the long slender fingers I will need. It seems to me that I always allow the chocolate to cool too much before I start enrobing (I guess I am always worried about melting the centres), but these are sturdy and should hold up. I carefully check the temperature range on the chocolate’s packaging, to ensure I have the correct crystallization curve (range of heating and cooling temperatures). For this type of chocolate, for the purposes of enrobing, it is: raise the temperature to 45-50 degrees Celsius, drop it to 27 degrees Celsius, raise it to 34.5 degrees Celsius. 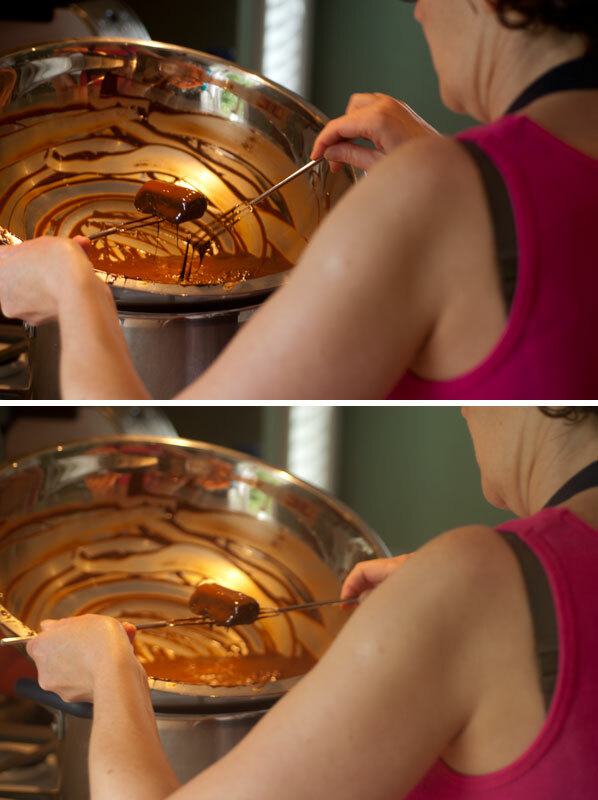 I prepare a bain marie, and using the widest bowl I have – 15 inches/38 cm across – melt my chocolate, check the temperature. Once it has hit 45 degrees, I get half of it on the marble slab and swirl it with my spatula and scraper, to tablier it. Once I feel it pull together, I scrape it back into the bowl, and stir it in with the rest of the chocolate. I check the temperature, and when it is at 34 degrees, I take a huge breath, and dunk my first piece in. I have a large Silpat mat ready to place the enrobed centres on, and the first one lands with a sliding motion, that leaves a small smear of chocolate in its wake. Okay, I must remember to tap the dipping forks against the side, to knock excess from the bottom. 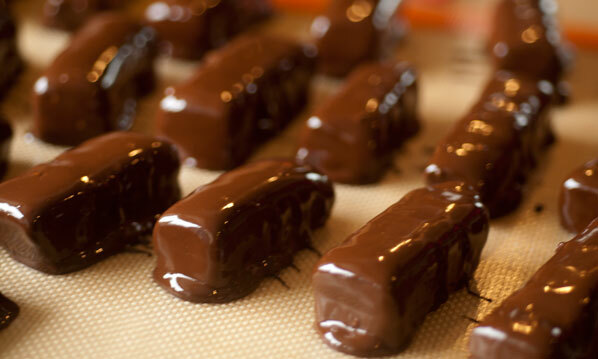 This seems to work well with the next one, and I develop a technique of dropping the bar directly into the chocolate, to seal any crumbs, cradling it between my two dipping forks (one is two tined, the other one has three) and gently rocking it back and forth to coat the top. I then lift it out with the two forks and knock one fork against the side of the bowl, keeping a fierce grip on it. I try to scrape any excess chocolate off the bottom, with the other fork, then slide the bar onto the mat quickly, off the three tined fork. My poor partner actually tried to engage me in conversation while I was doing this. This resulted in a messy chocolate covered blob, with ribbons of excess chocolate “drag marks”, and in me shouting words I hope the neighbours did not hear. After a while, I did develop a bit of a rhythm, and I finally managed to get all of the bars coated, with chocolate to spare. I am, however, a bit downcast, as it is apparent I have let the chocolate fall out of temper, by allowing the bain marie to get too hot. This becomes evident, when the caramel which, up to that point, had held up perfectly, began to become indented with fork marks – the chocolate was too hot. I should have remembered to slide the bowl off, and onto a tea towel, then back to the bain marie. There are still so many things to remember, which I am sure, some day, will be second nature, but at the moment, still require me to think my way through every step, and to take nothing for granted. It really is important to have a nice wide bowl for this technique, and I think the next time I enrobe, I will try to string a wire across the bowl (as I have seen done in the Ecole Chocolat technique lesson), to gently slide off excess chocolate from the bottoms. 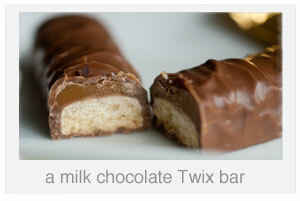 The Twix bars have set up now, and I am correct – the chocolate is not in good temper. Nor at this moment, am I. But my family and our lovely friend who has come over, are very complimentary about the taste of the bars. I ask them to note the lack of gloss and snap. They look guilty and nod. Yes, they’ve noticed. But I am assured by my son that “with a glass of milk, as soon as you bite it, you wouldn’t notice”. Our kind friend asserts: “They would be really terrific straight from the refrigerator”. No, these are not the nice, glossy bars I was hoping to produce. But I will definitely file this under “Lessons Learned” as we are advised to do with each lab for Ecole Chocolat. And I definitely feel it was time well spent. Next time, I will concentrate too, on the shape of the centres going into the chocolate, as I discovered, it is impossible to end up with a perfect rectangle if you have edges and bits sticking out, to begin with! 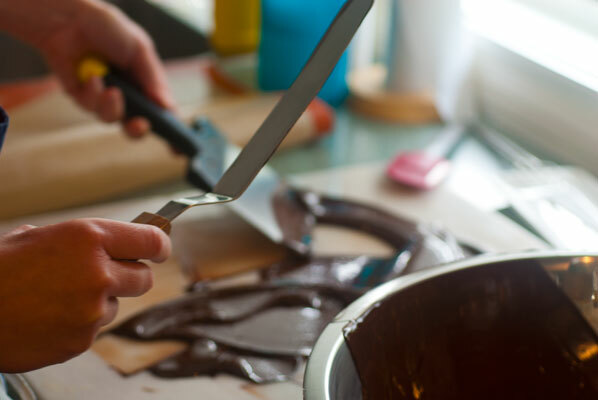 And I will temper and re-temper, and next time I will try to not rely so much on my thermometer (which is not as accurate as I think it is), and try to do it by feel, with my hands, and lower lip, as the finished tempered chocolate should be just a little lower than blood heat. And I am determined to dip again! I have a feeling that this could become quite relaxing and Zen-like, once I am confident the centres won’t slip off the forks, that my hand is steady, my movements quick and assured and that a little fine chocolate, in perfect temper, goes a long way.